A new study from the Canadian Women’s Foundation has found that Canadians’ understanding of consent has decreased over the last three years, with only 28 per cent of Canadians fully understanding what it means to give consent, compared with 33 per cent in 2015. The survey also revealed that 50 per cent of women in Canada have felt pressured to consent to unwanted sexual activity, which further demonstrates the critical need for education. In addition, nearly half of Canadians agree that education on how to give and get consent is the most important next step for the movement (44 per cent). Every May, the Canadian Women’s Foundation’s Campaign to End Violence raises awareness about gender-based violence and funds for violence prevention programs (including Teen Healthy Relationship Programs) and about 450 emergency shelters across Canada. These services aim to end the cycle of violence for future generations, and ensure that survivors have the support they need to rebuild their lives. Canadians can take action this month in a number of ways, including visiting any WINNERS or HomeSense store across Canada and buying limited-edition ball caps, tank tops, or t-shirts(100 per cent of net proceeds support the campaign). From April 23 to April 27, 2018, the Canadian Women’s Foundation partnered with Maru/Matchbox to conduct an online survey. The sample included 1,502 randomly selected Canadians aged 18 and over from Maru/Matchbox’s industry leading panel, Maru Voice Canada. The margin of error – which measures sampling variability – is +/- 2.5 nineteen times out of twenty. The results have been statistically weighted according to Census data by education, age, gender and region (and in Quebec, language) to ensure a sample representative of the entire adult population of Canada. Discrepancies in or between totals are due to rounding. 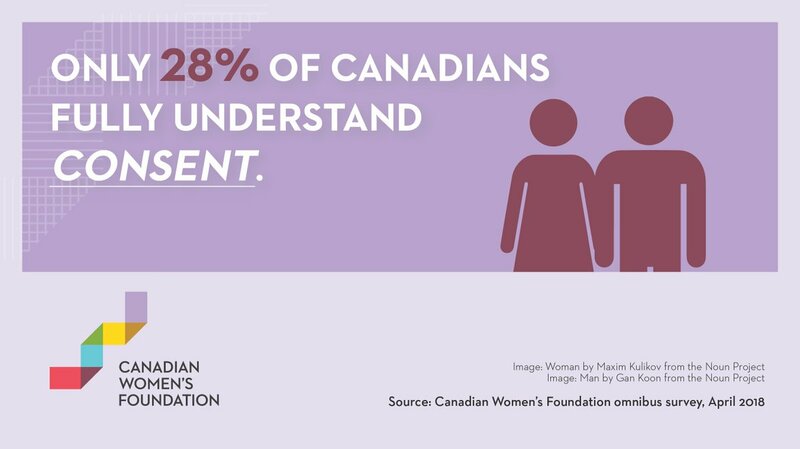 The Canadian Women’s Foundation is Canada’s public foundation for women and girls. We empower women and girls in Canada to move out of violence, out of poverty, and into confidence and leadership. Since 1991, we’ve raised money and funded more than 1,500 community programs across Canada, and are one of the largest women’s foundations in the world. We take a positive approach to addressing root causes of the most critical issues facing women and girls. We study and share the best ways to create long-term change and bring community organizations together for training and to learn from each other. We carefully select and fund the programs with the strongest outcomes and regularly evaluate their work. We have a special focus on building a community of women helping other women. Helping women creates safer families and communities, and a more prosperous society for all of us. We invest in the strength of women and the dreams of girls. For more information, please visit http://www.canadianwomen.org. Stay in touch with the Canadian Women’s Foundation by following us on Twitter, Facebook, and YouTube, by joining our E-newsletter, and by reading our Blog.